Throughout my career I have earned a reputation for value creation. My track record includes 6 start-ups, 7 turnarounds and sustainable growth within mid-cap businesses ranging from <$100M up to $3B+, and a 20+ year history of delivering sustainable top and bottom-line results. Growth driver who uses metrics-based strategy and high-EQ people leadership to excel in any market. Consistently realizes double-digit gains in turnaround, M&A, and organic growth scenarios. Brings frank, fresh eyes to global organizations, quickly identifying the best next steps and how to get there. Known for growing businesses domestically and across borders, having lived and worked extensively in-country. Cross-functional strengths in business development and operations—including business intelligence infrastructure and Lean methodology—yields consistent top- and bottom-line improvements, especially in environments that depend on efficient manufacturing, sourcing, and distribution. 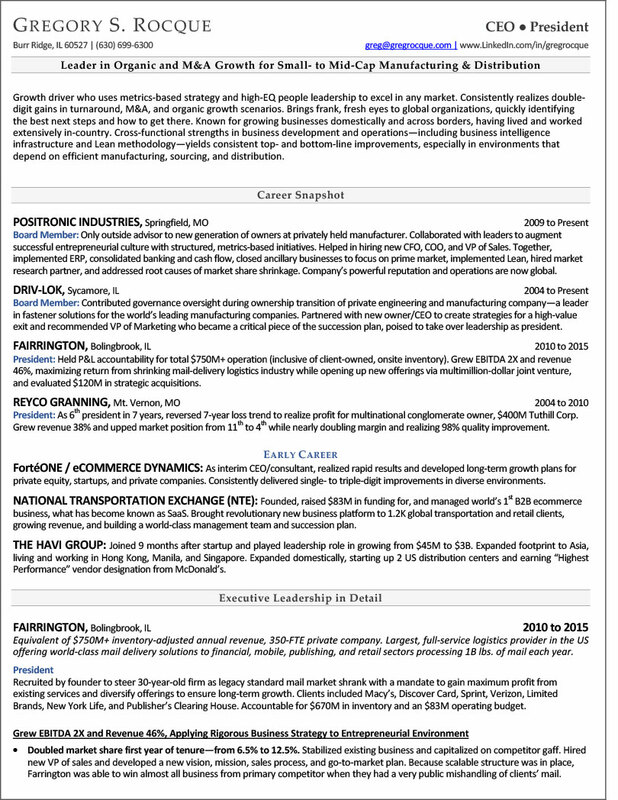 Board Member: Only outside advisor to new generation of owners at privately held manufacturer. Collaborated with leaders to augment successful entrepreneurial culture with structured, metrics-based initiatives. Helped in hiring new CFO, COO, and VP of Sales. Together, implemented ERP, consolidated banking and cash flow, closed ancillary businesses to focus on prime market, implemented Lean, hired market research partner, and addressed root causes of market share shrinkage. Company’s powerful reputation and operations are now global. Board Member: Contributed governance oversight during ownership transition of private engineering and manufacturing company—a leader in fastener solutions for the world’s leading manufacturing companies. Partnered with new owner/CEO to create strategies for a high-value exit and recommended VP of Marketing who became a critical piece of the succession plan, poised to take over leadership as president. President: Held P&L accountability for total $750M+ operation (inclusive of client-owned, onsite inventory). Grew EBITDA 2X and revenue 46%, maximizing return from shrinking mail-delivery logistics industry while opening up new offerings via multimillion-dollar joint venture, and evaluated $120M in strategic acquisitions. President: As 6th president in 7 years, reversed 7-year loss trend to realize profit for multinational conglomerate owner, $400M Tuthill Corp. Grew revenue 38% and upped market position from 11th to 4th while nearly doubling margin and realizing 98% quality improvement. FortéONE / eCOMMERCE DYNAMICS: As interim CEO/consultant, realized rapid results and developed long-term growth plans for private equity, startups, and private companies. Consistently delivered single- to triple-digit improvements in diverse environments. NATIONAL TRANSPORTATION EXCHANGE (NTE): Founded, raised $83M in funding for, and managed world’s 1st B2B ecommerce business, what has become known as SaaS. Brought revolutionary new business platform to 1.2K global transportation and retail clients, growing revenue, and building a world-class management team and succession plan. THE HAVI GROUP: Joined 9 months after startup and played leadership role in growing from $45M to $3B. Expanded footprint to Asia, living and working in Hong Kong, Manila, and Singapore. Expanded domestically, starting up 2 US distribution centers and earning “Highest Performance” vendor designation from McDonald’s. In 2009 I decided to originate an advisory board to help me become better at what I do. A very good friend of mine recommended that I consider Greg for a position on the board. I was told that Greg had a phenomenal business mind and based on the recommendation I asked Greg if he would participate. I consider myself very fortunate that Greg agreed to help me. While we have never elected a chair of the board Greg quickly became the leader. But he did so quietly, with professionalism, and in a manner in which he immediately earned the respect of everyone on the board. Greg has a way of asking the right questions, cutting to the core of a problem, simplifying it, and then of course solving it. Afterwards I wonder why it was a problem in the first place; the answer seems so easy now. My experience with Greg has been that he has excellent people skills, is a wonderful motivator, and a tremendous problem solver. It is easy for me to see how he has achieved the success he has had and I am sure he will bring continued success to himself and those associated with him. I worked with Greg at Christ Church of Oak Brook as he helped the senior ministry team make strategic decisions. Greg is an excellent strategic thinker. He was able to observe the strengths and weeaknesses of the team and recommend changes that are benefiting us today, nearly 6 years later. His experiences in logistics and manufacturing give him unique advantages as a manager. Working with his family business, he supported food establishments domestically and internationally. Greg is also a man of great integrity. His faith influences every aspect of his life. He is a person with whom I would share a fox hole in the field of battle. His humor and his sense of perspective make every problem managable. I highly recommend Greg in for a general management position. It has been my pleasure to know Greg Rocque both professionally and personally. We both served on the board of directors of the Southwest Area Manufacturer’s Association. During that time I was able to visit Greg at Reyco Granning and personally witness his and his team’s impact on their manufacturing business. Their application of and dedication to lean manufacturing practices was very effective and successful. Greg is a strong business leader and inspires those around him to be their best. On a personal level I have know Greg to be a very personable individual of strong morale character. I am proud to count him as my friend. I strongly recommend Greg for any position that he feels qualified to pursue and I welcome the opportunity for further discussion regarding his abilities. I have known and worked with Greg for nearly 10 years. Our first meetings were working together on a manufacturing industry board of directors. I quickly realized Greg had invaluable international business experience, a keen ability to identify problems, and the leadership skills to find solutions. Since then, he has joined the board of my mid-cap family owned private company. In that capacity, he brings his level-headed approach to problem solving. For a company that is ready to improve its culture, its performance and it’s bottom line, I believe Greg possesses the tools to achieve the results.